Cindy Fan (Ph.D., Ohio State University, 1989) is a Professor in the Department of Geography with research interests in population, migration, regional development, gender, ethnicity, and China. 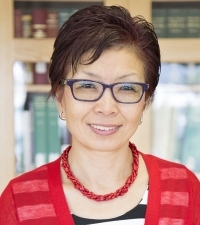 She is also Vice Provost for International Studies and Global Engagement, past Chair of the Department of Asian American Studies and former Associate Dean of Social Sciences. Distinguished Scholar Award, Asian Geography Specialty Group, American Association of Geographers, 2017. American Council on Education Fellowship, 2013-2014. Distinguished Teaching Award, UCLA, 2011-2012. C. Doris and Toshio Hoshide Distinguished Teaching Prize in Asian American Studies, 2010-2011. Outstanding Service Award, China Specialty Group, Association of American Geographers, 2008. Fan, C. Cindy (2018) “Population Mobility and Migration,” in The SAGE Handbook of Contemporary China, ed. Weiping Wu and Mark Frazier, pp. 848-877 (Chapter 40), Los Angeles, CA: SAGE. Chen, Chen and C. Cindy Fan (2018) “Rural-Urban Migration and Circularity in China: Analysis of Longitudinal Surveys in Anhui, 1980-2009,” Geoforum 93: 97-104. Fan, C. Cindy (2018) “Migration, Gender, and Space in China,” in Modernity, Space and Gender, ed. Alexandra Staub, pp. 305-319 (Chapter 17). New York, NY: Routledge. Chen, Chuanbo and C. Cindy Fan (2016), “China’s Hukou Puzzle: Why Don’t Rural Migrants Want Urban Hukou?” The China Review 16(3): 9-39. Howell, Anthony, Canfei He, Rudai Yang, and Cindy Fan (2016), “Technological Relatedness and Asymmetrical Firm Productivity Gains Under Market Reforms in China?”Cambridge Journal of Regions, Economy and Society 9: 499-515. Fan, C. Cindy (2016) “Household-Splitting of Rural Migrants in Beijing, China,” Trialog: A Journal for Planning and Building in a Global Context 116/117, 19-24. Fan, C. Cindy (2015) “Migration, Remittances, and Social and Spatial Organization of Rural Households in China,” in Transnational Labour Migration, Remittances and the Changing Family in Asia, edited by Lan Anh Hoang and Brenda Yeoh, pp. 194-226 (Chapter 8). Basingstoke, UK: Palgrave Macmillan. Fan, C. Cindy and Chen Chen (2013) “New-generation Migrant Workers in China,” in Transient Urbanism: Migrants and Urbanized Villages in Chinese Cities, edited by Fulong Wu, Fangzhu Zhang and Chris Webster, pp. 17-35 (Chapter 2). London and New York: Routledge. Wang, Wenfei Winnie and C. Cindy Fan (2012) “Migrant Workers’ Integration in Urban China: Experiences in Employment, Social Adaptation, and Self-Identity,” Eurasian Geography and Economics 53(6): 731-749. Wang, Wenfei Winnie and C. Cindy Fan (2012) “Xifang guonei renkou qianyi yanjiu jinzhan ji qushi (Progress in Internal Migration Studies in Western Literature),” in Renkou Xue (Demography), edited by Zai Liang, pp. 174-208 (Chapter 6). Beijing: Renmin University Press (in Chinese). Sun, Mingjie and C. Cindy Fan (2008) “Regional Inequality in the Pan-Pearl River Delta Region,” in The Pan-Pearl River Delta: An Emerging Regional Economy in Globalizing China, edited by Y.M. Yeung and Jianfa Shen, pp. 241-269 (Chapter 9), Hong Kong: The Chinese University Press. Fan, C. Cindy (2004) “Gender Differences in Chinese Migration,” in Changing China: A Geographic Appraisal, eds. Chiao-min Hsieh and Max Lu, pp. 243-268 (Chapter 15). Boulder, CO: Westview Press. Fan, C. Cindy, Laurence J.C. Ma, Clifton W. Pannell and K.C. Tan (2003) “Geography of China,” in Geography in America at the Dawn of the 21st Century, eds. Gary L. Gaile and Cort J. Willmott, pp. 668-678 (Chapter 41). New York: Oxford University Press. Fan, C. Cindy (2002) “Population Change and Regional Development in China: Insights based on the 2000 Census,” Eurasian Geography and Economics, 43, 6, 425-442. Fan, C. Cindy and Jiantao Lu (2001) “Foreign Direct Investment, Locational Factors and Labor Mobility in China, 1985-1997,” Asian Geographer, 20(1 & 2), 79-99. Fan, C. Cindy (2001) ”Guest Editor’s Introduction: New Themes and Forces of Regional Development in China,” Asian Geographer, 20(1 & 2), 1-5. Fan, C. Cindy (2000) “Migration and Gender in China,” in China Review 2000, eds. C.M. Lau and J. Shen, pp. 423-454 (Chapter 19). Hong Kong: Chinese University Press. Fan, C.C. (1995) “Developments from Above, Below and Outside: Spatial Impacts of China's Economic Reforms in Jiangsu and Guangdong Provinces,” Chinese Environment and Development, 6(1 & 2), 85-116. Fan, C. Cindy (1992) “Regional Impacts of Foreign Trade in China, 1984-1989,” Growth and Change, 23(2), 129-159. Fan, C. Cindy (1992) “Foreign Trade and Regional Development in China,” Geographical Analysis, 24(3), 240-256. Fan, C. Cindy (1992) “An Investigation into the Dynamics of Development Inequalities via Expanded Rank-Size Functions,” in Applications of the Expansion Method, eds. J.P. Jones III and E. Casetti, pp. 185-212 (Chapter 9). London: Routledge. Casetti, Emilio and C. Cindy Fan (1991) “The Spatial Spread of the AIDS Epidemic in Ohio: Empirical Analysis Using the Expansion Method,” Environment and Planning A, 23(11), 1589-1608. Population, migration, regional development and policy, inequality, gender, ethnicity in North America, post-Mao China. “UCLA Area and International Studies," Andrew Mellon Foundation, 2012-2017. "Migration, Policy, and Household Strategies in China, 1985-2004," National Science Foundation, 2005-2010. “Marriage Migration in China: Structure, Agency, and Socialist Transition,” National Science Foundation, 2000-2003. “Collaborative Research: Recent Migration in China and the Impact of the Hukou System,” National Science Foundation, 1997-2001. “Internal Migration in China: The Hukou System, Labor Market and Social Change,” Luce Foundation (subcontract), 1997-2002. “Regional Policy, Spatial Polarization and Inequality in China, 1982-1990," National Science Foundation, 1993-1995.